This week Charlotte has been out of school for 3 days. The crazy cold spell that hit the south kept the buses off the streets and the kids wishing they could go outside. But in our house 6 degrees outside and no under armor means that mom just has to think of LOTS of things to do. To the kitchen we go! Originally we were going to attempt to create play dough from different types of products in the kitchen. I am pretty sure its very logical and I know I could “google” or “pinterest” it, but i am crafty and like to self create. What resulted in our kitchen adventure was NOT homemade play dough……it was quicksand. We created some sort of concoction that delighted us. It was powdery and solid when you crunched it but as soon as you let go it immediately went back to a liquid base and melted right through your fingers. Practically magic! We had so much fun on this accidental science experiment, that we wanted to share it with all of you! Keep in mind that this is a bit messy, so while we did let Phoenyx (2) play with us, he fully needed the tub after we were done. 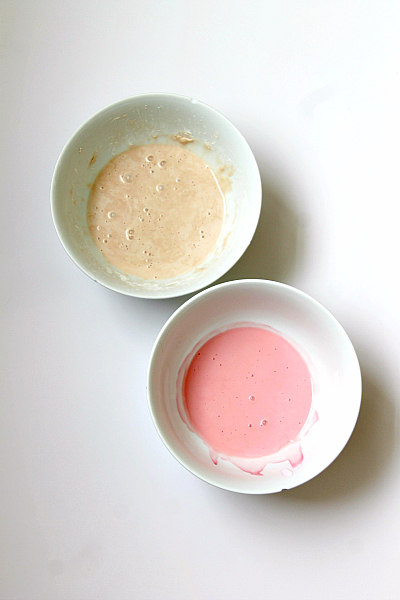 Add your 2 parts cornstarch and 1 part liquid into a bowl and mix! We chose to use fruit juice and chocolate milk. Keep in mind we thought we were doing something totally different then what turned out, but I love the colors in those items and it made our quick sand smell yum! You now have your kitchen quick sand! Now the fun part! First push your finger into the bowl. You can feel how hard it is! But try to pick it up…turns into a solid and can be nearly crumbly. Let your hand go flat…it starts to immediately go to liquid before your eyes! Want to see it in action? Check out our video! You can watch us make it solid and then let go to see it liquid! oobleck! We made this last year, and I was more amazed than my daughter. It’s a solid! It’s a liquid! We’re getting ready to do this! Thanks!! We have a snow day tomorrow, so we are definitely going to be making this! My kids are going to LOVE it!! Great idea! My daughter loves all things slimy, gooey, etc. She will have a great time with this. So much fun! What a great activity for a cold day. This looks fun and easy to make. 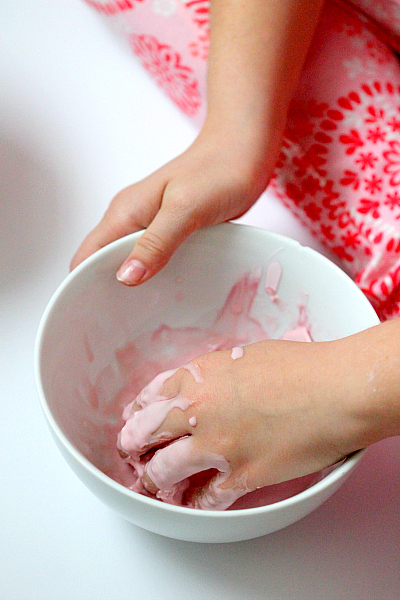 I have some cornstarch so I am going to get messy with the kids this weekend and give this a try! I love that she calls it Magic! 🙂 That is really cool. We love the kitchen quick sand. It feels so cool! Wow that is so strange. I’m gonna do this with the kids, looks neat! Looks like a ton of fun! I’ve heard of oobleck before but haven’t ever made it. Brilliant! I’ve seen a tutorial for an Ooblek like this before, but the directions were crazy complicated and not something I had time for. We definitely have time for your ‘recipe’. 🙂 Thanks so much! My kids LOVED playing with that stuff. It’s such a weird and fun bit of science! That’s awesome! I have a huge container of corn starch for cooking, but I only use maybe a teaspoon at a time. I know what I’ll be doing with the rest of it now! I made this with my kids when they were little. Oh my goodness, they loved it and thought it was the best thing ever. I seriously don’t know why I ever bought them toys! This could keep my daughter occupied for hours. That is so cool! We loved doing science experiments when my kids were little! Have you made flubber? So fun! This looks like so much fun! If you’re a neat freak, putting it in a sandwich baggie will still give you some of the same sensory input without the mess… Pinning this now. Wonderful pictures! It’s like I’m there watching it dribble through their tiny fingers! We made something like this once. I know if my boys read the title of this post they would want to dig out a trench around their ‘fort’ out in the pasture & fill it with mass quantities of this stuff!